Is Anesthesia-Free Dental Care the Best Option for Pets? For many pet owners, anesthesia-free dental care sounds like a great option for your pet. You don’t need to put your pet under general anesthesia, and they come out with clean, healthy looking teeth. But the truth is: it’s anything but a good idea! It’s important for you, as a dog owner or cat owner, to be well-educated on what an anesthesia-free dental procedure involves and the risks that your pet faces, as a result. The process known as no-anesthesia or anesthesia-free dentistry involves scaling the outside surfaces of your pet’s teeth without anesthesia and with little or even no sedation. This practice is done in some veterinary clinics, but it is most commonly done by dog groomers and boarding facilities. Anesthesia-free procedures do not remove plaque and bacteria from underneath the gum line, a region that cannot be examined unless an animal is under anesthesia. This plaque under the gum line leaves the animal at risk for the development of periodontal disease, which is the destruction of bone, gum tissue and other structures that hold teeth in place. 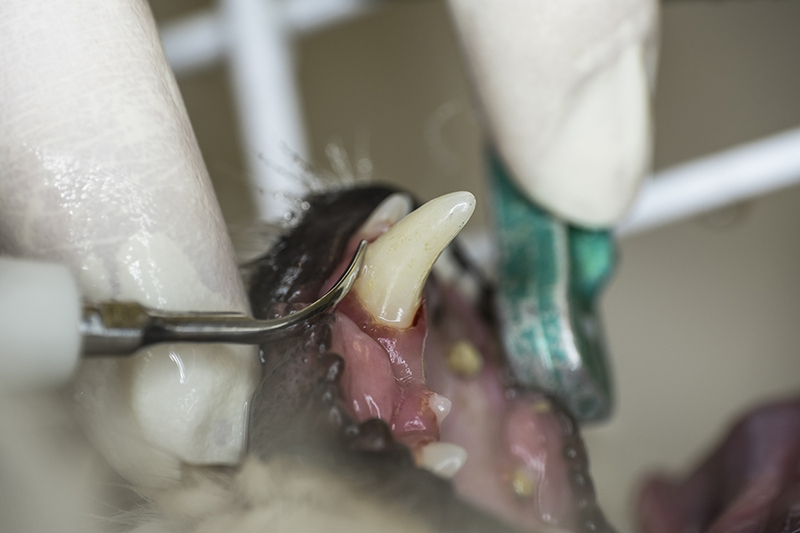 Additionally, sharp instruments are needed to scale the teeth, and doing this procedure in an awake or only sedated animal can be very dangerous. If the animal should move his or her head - even slightly - while these sharp instruments are being used, serious injury can result in the form of cuts, scrapes, or impalements of structures in and around the mouth or any part of the animal’s face. In order to get the most thorough exam of the inside of the mouth, anesthesia is required because the majority of signs of periodontal disease are below the gum line. Using a dental probe to find deep pockets and dental x-rays to find problems with parts of teeth that are under the gum line require anesthesia, as well. These techniques help spot diseases, broken teeth, oral tumors, and other problems that require immediate treatment. In our experience at Delavan Lakes Veterinary Clinic, the vast majority of pet dental inspections identify at least one tooth with a problem requiring treatment. Only a licensed veterinarian is qualified to treat these issues. Anesthesia-free dental cleanings provide no real benefits to your pet. It will not aid in the prevention of periodontal disease or identification/treatment of potential problems in your pet's mouth, but will put your pet at risk for injury and neglect of root abscesses/cavities. If you're concerned about your pet’s dental hygiene and oral health, please reach out to our friendly staff. For our dental procedures, we use general anesthesia, take dental x-rays, do a thorough exam of your pet’s mouth, and scale the areas of the teeth including under the gum line to ensure we are providing the best care. This, in turn, ensures your pet's smile will continue to do what it does best: Make you smile.